I mentioned in the previous MODFOUNTAIN blog, that we were working on a super, secret project. Last October, at the Long Beach Landscape Architects Expo, we displayed 9 small scale working models of our fountains. The purpose of those small models was simply to illustrate the different Modfountain designs available for purchase. I began to find it annoying when one after another of the visitors and passersby would comment that they loved the small table top fountains and could envision them in design projects both indoor and outdoor and could they possibly buy one or more, or all of them. I would answer with exasperation,, "No, they are NOT for sale, they are only here to illustrate our larger scale fountains!" After what seemed like the 73rd inquiry we finally asked ourselves, "Why are we saying NO?" Rick Ivey, one of the Expo visitors who happens to be the owner of Laguna Coast Pottery in Laguna Beach, convinced us that there was a ready market for a table top version of our cutting edge steel fountains. 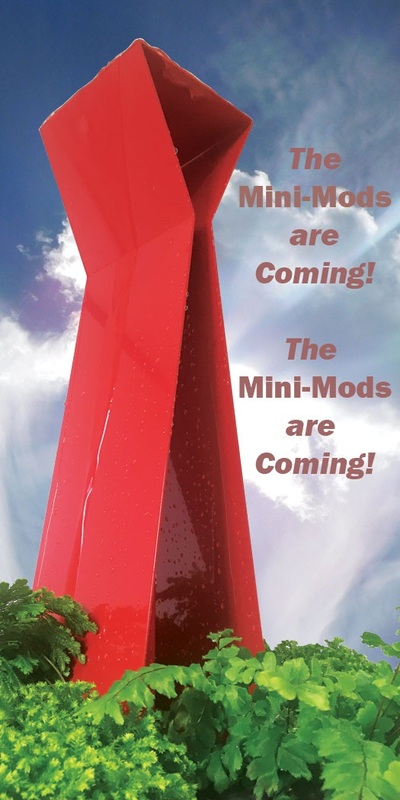 With his help and facilitation, we are now proud to announce that the first edition of what we've christened the "Mini-Mods" are currently in production. So what is a Mini-Mod? Well, first of all, they're collectible. These fully functional 18 inch tall steel fountains come signed and dated with a certificate of authenticity. They also include a custom designed display pond constructed from lightweight poly concrete, a submersible pump and a special screen for displaying decorative rock. The pond can also be used as a planter for surrounding the fountain with water dense vegetation and flowers (my personal preference). Another exciting feature of the Mini's is that they are available in COLOR. Early adopters who purchase these collectibles, will get their choice of powdercoat finishes in super durable high gloss variations of Red, Yellow, Teal and Chrome as well as our traditional finish of naturally aging Rust . We're really excited about the Mini-Mods. Their display possibilities are endless. We're shooting for a release date in Spring of 2019. So stay tuned to this blog, I'll keep you updated as things progress.